As originally published by Quickread, October 2013. In this article, Dr. Carl Sheeler, responds to a September 9, 2013 concept paper authored by Rick Baumgardner, Chair of the Appraisal Practices Board of the Appraisal Foundation, titled "Valuation Issues in Separating Tangible and Intangible Assets." In his white paper titled "Valuation Issues in Separating Tangible and Intangible Assets," a concept paper dated September 9, 2013, Rick Baumgardner, Chair of the Appraisal Practices Board of the Appraisal Foundation, lays out the time-tested debate of how we should or shouldn't define tangible and intangible assets. He believes this difference in perspective, along with widely varying valuation methodologies and techniques creates an environment for inaccurate valuation or worse, appraiser bias. In his opening thoughts, Mr. Baumgardner expresses a need for a dialogue about the various methods and techniques presumably influencing credible assignment results. Be that as it may, it seems to me that the underlying issue of concern that runs through the paper is the risk of bias. I'd like to give my colleagues in the industry the benefit of the doubt and say that the vast majority of professionals are doing the best they can with what they have. What we actually seem to have here isn't an issue of rampant bias, but a difference of opinion or definition as to what qualifies as a tangible or intangible asset. Miscalculations over this single issue due to misunderstanding have far more possibility and probability to alter outcomes than bias. Perhaps we should assume appraisers innocent before proving them guilty and focus on the fact that a "competent" or "well-informed" appraisal is always one in which the valuator has a clear understanding of what constitutes an intangible asset. There will always be questions or concerns over this issue, but I would like to have seen the overall theme of the analysis to have been more akin to, "What would a reasonable investor do?" While most reports reflect a single value, appraisers are retained to consider the "bid-ask" spread common to all negotiations of which value is one element of consideration. The first issue addressed is whether and how income derived from other than the real property asset ought to be considered. A motel/hotel where income may be derived from an onsite restaurant is used as an example. In this scenario, one needs to step back and consider that income derived from ancillary operations and assets is fairly common for businesses of this nature, such as a coin operated laundry facility in an apartment complex. The operation of this service is part of the economic benefit derived from the collection of assets. Conversely, the absence of an onsite laundry might result in the tenants requesting a rent reduction. These types of establishments also hold many other kinds of intangible asset streams including signage for advertisers or airspace rights for cell towers. Clearly, there are other unseen related property rights that may not be readily assigned to the real property, but are uniquely beneficial to the investor nevertheless. It's also important to consider branding, as there may be economic benefit derived from being a Best Western® versus a Ramada® or "Fred's Fortnight Fortress for Families." I'm reminded of a mega church in Southern California whose parishioners tithed millions annually. Is this income stream associated with the structure, the spiritual "rock star" minister, or the site where special use value was clearly greater than the cost to construct it? Eventually, the "rock star" fell from grace and the building was purchased at a below-cost value. Depending on how rights are assigned and the uniqueness of the brand or property, the capitalization or discount rates may need to incorporate consideration of these attendant risks and rewards of the blended income derived. Alternately, if the income and source can be isolated, then a more preferred methodology can be applied. Therefore, I do not believe the issue is that divergence may reflect correct and incorrect application of methodology to capture attendant risks. I believe that more often, there is an underlying unique situation that deserves further documentation to support how value is obtained. This, too, is consistent with the generally accepted risk profile standard of "same or similar." It certainly is unlikely to be the result of an "integrity issue", which the analysis seems to imply. Allocating intangible assets between each other and from tangible assets is common practice for many business valuators, and I am well aware of the difference of opinion and/or definition of my real estate appraisal colleagues on this issue. It is my hope that this concept paper and my response can open a dialogue that might lead to some form of consensus and not partisan conviction. Competency in valuation and allocation only comes with time, experience and the variety of purposes for which these services are provided. Therefore, I would like to offer some clarity to the distinction/ differentiation of what Mr. Baumgardner sees as a confused overlapping of terms that contribute to the problem of adequately and accurately addressing the "lack of common terms" with the verbiage of several widely-accepted definitions. An operating entity presumed to remain so if its performance is sufficient to justify investment. An assemblage of tangible and intangible assets. 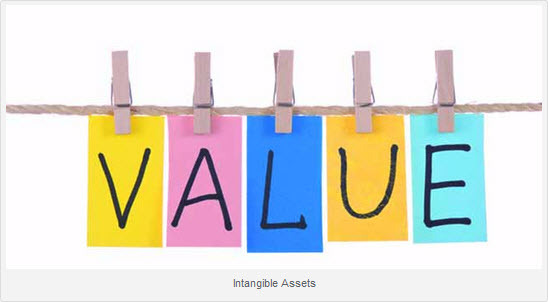 A subset of intangible assets associated with the person and/or entity (commercial). Amortized based upon life and reflects economic benefit beyond that derived from tangible assets, such as, but not limited to, net fixed assets, cash, notes, accounts receivable, inventory, etc. An example may be human capital. It is not reported as a tangible asset but clearly, the business will expect it. If the collective and specialized knowledge base of employees is properly harnessed, the economic benefit may well exceed that of the assemblage of tangible assets. Enterprise Value (Likely reflecting an asset-based sale where all assets tangible and intangible are valued at market, versus book). This differs from 100 percent equity value in that tax considerations and certain liabilities may attach. Of great concern for me was the assertion, that, "Value opinions such as 'going concern value,' 'value in use,' or a 'special value' to a specific property user may not be used as 'market value' for federally related transactions." If an SBA business loan does not consider value-in-use of equipment-that may generate 80 percent of a manufacturer's economic benefit-then it's clearly underreporting value. Similarly, the use of a going concern value-that would include both tangible and intangible assets whose combination is presumed to create more value than simply its assemblage-would similarly result in an understatement. Now, if the issue under consideration is, should such items be appraised by a properly skilled appraiser, then I can see the reasoning behind the restriction. I am a proponent of standardization as long as expediency and decision by committee do not dilute the unique nature of the myriad of shifting variables that must be considered and are seldom in a vacuum when valuing property and attendant rights. I am reminded that PhDs developing quantitative algorithms, who received six and seven figure salaries, forgot the essence of behavioral economics and proceeded to lose billions of dollars in hedge funds during the financial crisis. No doubt a system should not be static, and most truths need room for exceptions. Ask Bernanke. Further into the analysis, Mr. Baumgardner appears to imply that selecting a specific method based upon what is better for the client may lend itself to bias or advocacy. If we were retained to provide value in a range, which is a continuum of the choices a pool of investors may make or have made, this issue would not exist. Consider how the Treasury addresses this when public stock is held and is to be valued. The CPA is required to take the daily average of the day's high and low. It fails to consider the overall direction during the day, the period preceding it, or that post-close trades may be both higher and lower. 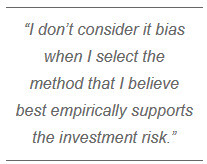 I don't consider it bias when I select the method that I believe best empirically supports the investment risk. The next point of concern is where the text questions if the appraiser did everything correctly and casts doubt upon why he or she would have differing results within and between approaches and methodologies. Every approach and methodology has some assumptions with constraints of time and resources based upon scope of work. So, Kaizen theory would suggest it is a better investment of time to be sure with 97 percent certainty than to double the fee due to time and resources to be 98 percent sure. The results are also only as good as the data gathered, analyzed, and synthesized. The whole concept of arbitrage is to discover an "advantage" not known or available by the other investor(s). This can be shown by high-speed trading, which has less to do with company-specific risk and more to do with trading volume and microchanges in share prices. So, with deference to Jim Hitchner, there are times where between methods within an approach and between approaches, there are differences of how risk is captured, which may have more to do with capital markets or short-term trends. Unless, I am missing something, the question of, "Should any method chosen by the appraiser be reflective of market participants?" is not on-topic for the answer we're seeking.. Any valuator who has opined on a non-controlling equity interest in an underperforming asset/entity, draws on the level of concessions likely to occur to close a transaction. In actuality, the chances of achieving the desired return is more comparable to a lottery ticket, with the investor likely reflecting intrinsic motivations. Yet, we must opine on such equity despite an unlikely pool of investors at almost any value. We have waded through many issues, and not all of my concerns were covered by this review. I'm passionate that there is much more to be done to bridge the divide between the appraisal disciplines, so we can tap into one another's body of knowledge. I'm a firm believer in mutual professional support as a foundation for the success of the industry. However, if we intend to come to agreement on the definition of specific terms or the use of various methodologies, then that dialogue must begin with mutual respect, not an assumption of guilt. While I would like to have seen a more direct approach to creating a consensus of best practices put forward, I do believe that welcoming dissention with the intent of collaboration may yet contribute to that end.